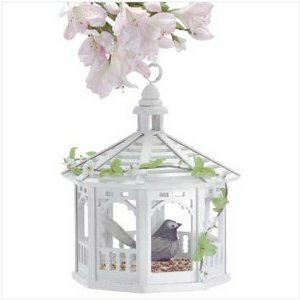 Add a touch of style with gazebo bird feeders. Gazebo feeders come in a variety of styles and are not expensive. Most backyard bird watchers have at least one of these feeders in their garden. Basically, a gazebo feeder is a bird feeder shaped like a gazebo. 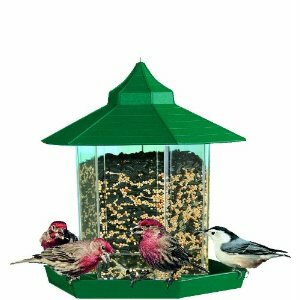 It is a combination of a hopper feeder and a platform bird feeder. The platform forms the base of a central seed container and the seed container can be filled through a hole in the roof. You can be use almost any type of wild bird seed including black-oil sunflower seed, safflower seed and most wild bird seed blends. I recommend filling it outside where you are going to hang it, because it can be to messy fill. And the bigger wild birds will enjoy the spilled seed. Make sure the twine or other hanger material is strong enough to hold the weight of the seed. Clean your empty gazebo feeder at least once a week to prevent seed from going sour or mouldy. Monitor how quickly the birds empty this feeder. Then fill accordingly. I love this gazebo birdfeeder! Made from wood and plastic - 8 1/2" diameter x 10 1/2" high. It is tastefully trimmed with gingerbread mouldings and greenery and is very attractive. 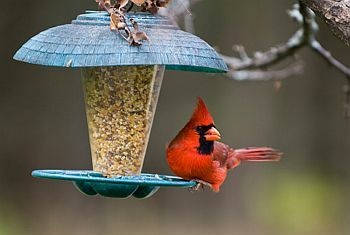 Cardinals and many other kind of birds will enjoy eating in it. The birds love this feeder... Even the cardinals. The price is a steal, makes a great starter bird feeder for new wild bird watchers. Not really secure enough to hold the weight of the seed. But, add some twine and loop over a branch and it should be fine. The construction is sturdy, with a simple yet attractive appearance, and the birds line up to use it. I highly recommend this feeder! Has a short neck and large head, giving it a distinctive spherical body shape. It also has a long, narrow tail and a short bill. This cute, curious bird is one of the first that people learn about. It's cap and bib are black, with white cheeks, the back soft gray, and grey wing feathers edged with white. Underparts are soft buff-coloured on the sides grading to white underneath. They associate in flocks. They often fly across roads and open areas one at a time with a bouncy flight. Live in any habitat that has trees or woody shrubs. Also sometimes in weedy fields and cattail marshes. Every autumn Black-capped Chickadees allow brain neurons containing old information to die, replacing them with new neurons. This allows them to adapt to changes in their social flocks and environment despite their tiny brains. 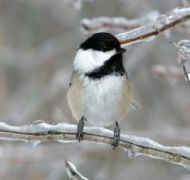 Both male and female chickadees excavate nests in a cavity in a site usually selected by the female. Flocks have many different calls with specific meanings. The calls may contain some of the characteristics of human language. They feed on insects and seeds - hiding their food to eat later. At feeders they take mostly sunflower seeds, peanuts, suet, peanut butter, and mealworms. Conservation status is Least Concern. Benefits from people who keep bird feeders.